The 503 bus service which connects Hambledon with Godalming and Guildford has been cut to twice a week. It now operates on Tuesdays and Fridays only, with two services in each direction. Until this month it operated on three weekdays, Monday, Wednesday and Friday. The parish council received no advanced notice of the reduced service. 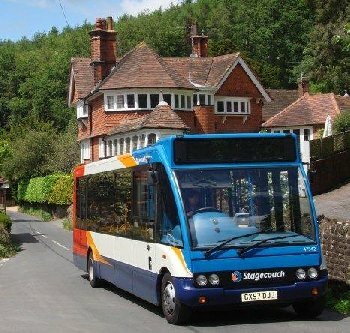 The 503 is operated by Stagecoach on behalf of Surrey County Council, which subsidises the service. Cuts in local authority budgets have resulted in reduced timetables across the county. The new timetables has the first 503 departing Lane End at 9.15am and the second at 12.15pm. The route take the bus through the village to Hydestile, Milford, Godalming and then on through other villages to Guildford. The return services leave Bridge Street, Godalming, at 11.42am and 2.02pm. The full timetable for the revised service can be found by following the link.